California’s capital offers enough dining, entertainment, and cultural experiences to keep you busy day and night. But what if you’re looking for a fun way to enjoy Sacramento without going over budget? We’re dropping the dime on a few fun ways you can enjoy a day downtown without breaking the bank (or even dipping into it). Bookworm or not, you’ll find the library an unforgettable Sacramento destination. Located between 7th and 8th on I Street, Sacramento Central Library stands where it was built as one of the thousands of Carnegie Libraries across the country in 1918. 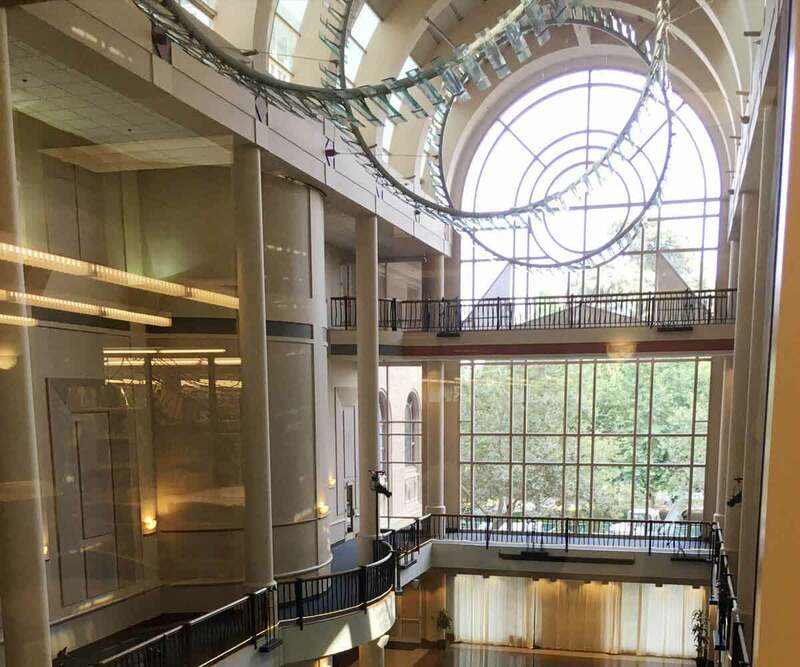 A four-story high glass entryway connects the historic structure to a newer wing of the library, which was built in 1992. Explore floors two through four if you’re on the hunt to check out a book, but while on each floor be sure to wander to the East side of the room and take in the grandeur of the Tsakopoulos Library Galleria’s five-story atrium. Also built in 1992, the hall has been host to countless weddings, dinners, dances, speeches, concerts, political events and more. The ground floor of the library is dedicated to books sales that benefit the Friends of the Sacramento Public Library, a volunteer non-profit organization that advocates, fundraisers, and provides critical support for the Sacramento Public Library. Sacramento Central Library's Tsakopoulos Library Galleria. If you have kids in tow you won’t want to overlook Central’s bottom floor. On your way down the stairs, your littles will be greeted by an impossible-to-miss t-rex skeleton sculpture. In the basement level of the library – dedicated entirely to children – you’ll find a vast collection of children’s books. If this basement is the sundae, then the oversized kids play area is the cherry on top. Kids can play with a variety of toys beneath the beautiful mural depicting the Sacramento Riverfront that wraps around the play area. Sometimes called the 'Jewel in the Crown' of Sacramento's Central Library, The Sacramento Room houses the Special Collections of the Sacramento Public Library in the original reference room of the 1918 Carnegie-funded City Library. Dedicated to promoting an appreciation and understanding of the history of Sacramento by collecting, preserving, and providing access to special collections relating to the diverse history of the area The Sacramento Room is restored to its original spender and is open to the public. Tour the vast and varied murals that have been added to Sacramento’s cityscape over the past three years by both local and international artists who’ve participated in the Wide Open Walls event. Whether you’re hoofing it, pedaling, or driving from one location to the next, you can cruise around downtown and midtown to take in original works by a multitude of artists. Created by a non-profit group whose mission is to celebrate and promote public art, Wide Open Walls hosts art events to inspire an appreciation of art in the community. They also aim to foster an appreciation of local art experiences, as well as a desire to take part them. 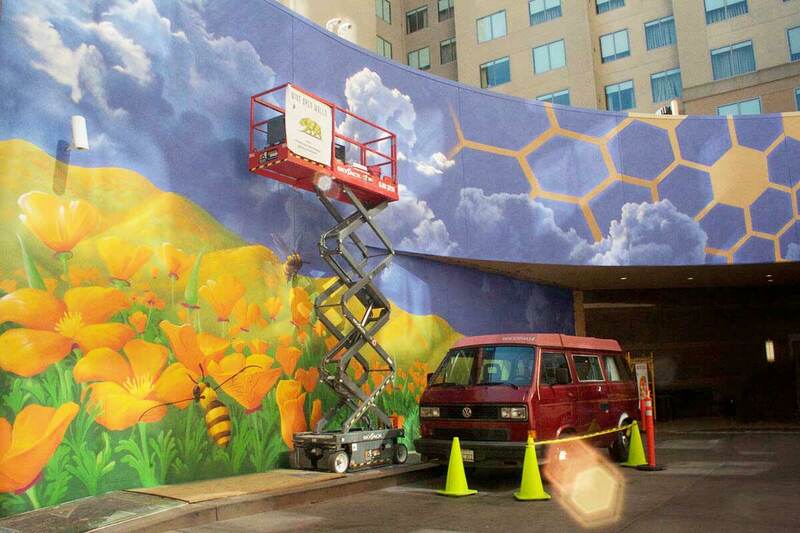 The Kinetic Ideas’ mural can be seen at 1121 15th Street, at the Residence Inn by Marriott Sacramento Downtown at Capitol Park Hotel entrance. Yes, Wide Open Walls is good for the community. But it’s also really great for your eyes. Beautifying Sacramento one wall at a time, the murals that go up at each year’s festival in August are transforming our city into one huge art gallery, open for one and all to enjoy. Bonus: Enjoy the Wide Open Walls event in progress. If you happen to be exploring during the event in August, you can enjoy watching the artists at work. Watch the process from beginning to end, as they complete everything from small murals to larger than life works. For example, in 2018 Shepard Fairey completed a 15-story high mural of the Man in Black which was inspired both by the 50-year anniversary of Johnny Cash’s world famous performance at Folsom Prison and his work in prison reform. 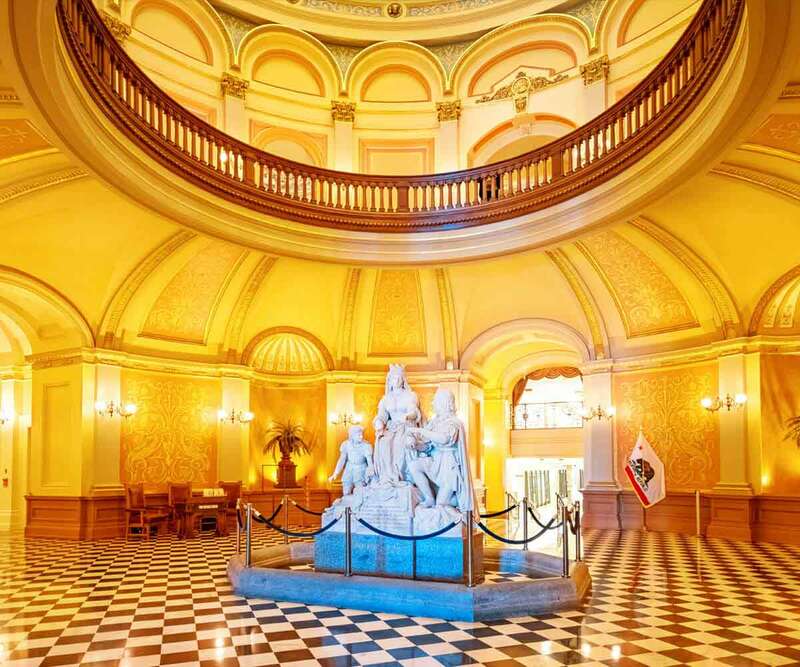 Have you ever spent an afternoon exploring the history and architecture of California’s state capitol? It’s easy to get lost in the grandeur of the towering dome-shaped central rotunda or the natural beauty of the gardens. Bearing a striking resemblance to the Nation’s Capitol in Washington D.C., the California State Capitol was completed in 1869. Its neoclassical Greek architecture style serves as a nod to the Greek and Roman influences on American democracy. Free daily tours are available to educate the public about both its architecture and history. On the first floor of the California State Capitol Museum, visitors can view several inspiring revolving exhibits and restored historic rooms, while a lower level theater presents films. Rotunda of the California State Capitol building with the Statue of Queen Isabella & Columbus. As a working capitol building, you are welcome to ask if legislators are in session and inquire about public access to galleries where you can view bills being debated or votes being cast. The adjacent 40-acre Capitol Park is home to trees from around the world, a wide variety of plants and flowers, as well as several memorial exhibits. Pack a lunch and grab a blanket to enjoy a picnic in the Rose Garden, located between N and L Streets on 15th. Home to over 650 roses in more than 153 varieties, colors, and fragrances, the Rose Garden features inspirational plaques with peace messages written by grade school children. The southeast section of the gardens is a test garden for All-American Rose Selections where visitors have the opportunity to see new rose varieties before they are available to the public – a rare honor that is bestowed upon the World Peace Rose Garden. If you’re looking for a fun way to immerse yourself in downtown culture while on a tight budget, these 3 fun ways to play for free in Sacramento are just the ticket.